(0 Customer Reviews) | Write Review 4 issues per year Total MX-5 magazine is the only independent publication in the world to exclusively feature Mazda's iconic sports car, the MX-5. Launched in September 2016, Total MX-5 celebrates the world's best-selling sports car (over a million and counting) as it approaches its 30th birthday, reflecting its huge popularity and appeal. 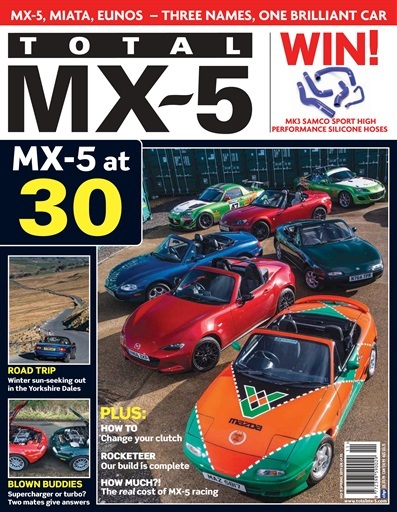 Each issue of Total MX-5 contains a cross-section of features guaranteed to appeal to MX-5 owners and enthusiasts, including technical features, interviews with key MX-5 innovators and owners, drive stories, competitions, readers' cars, problem solving by our very own technical guru, performance tuning and modifying, road tests, DIY tips, and much, much more. Above all, Total MX-5 is written by MX-5 enthusiasts for MX-5 enthusiasts. Readers’ Ride – How low can you go? Total MX-5 magazine is the only independent publication in the world to exclusively feature Mazda's iconic sports car, the MX-5. 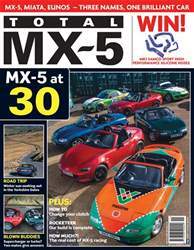 You'll receive 4 issues during a 1 year Total MX-5 magazine subscription. You'll receive 4 issues during a 1 year Total MX-5 magazine print subscription.